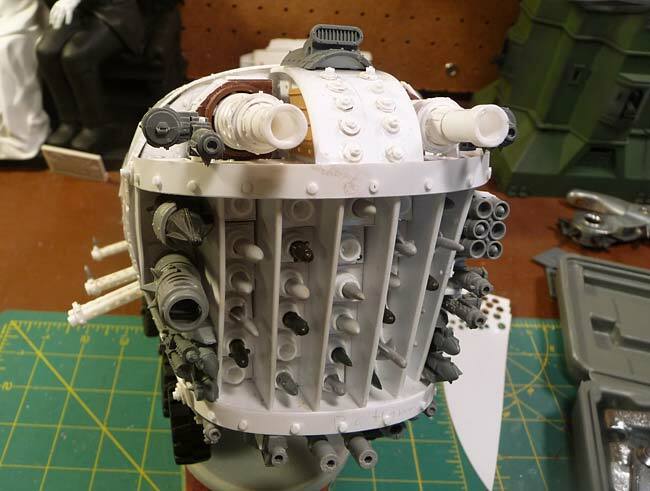 Ork Superheavy Blasta Bomma Brought Out of Mothballs! 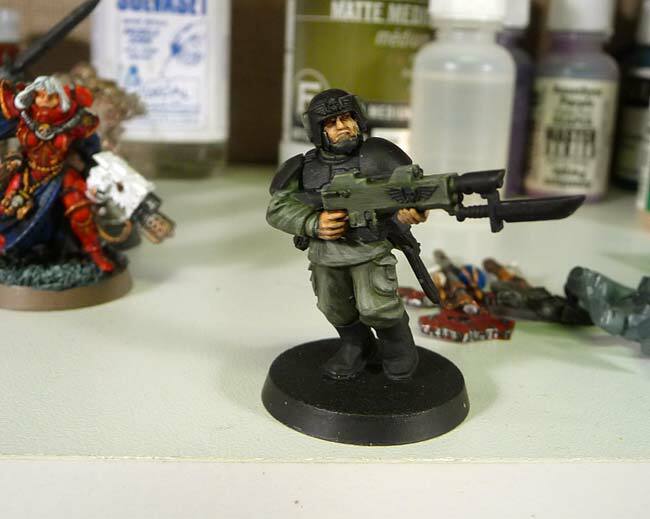 by sukigod on November, 26, 2012 in Apocalypse, Blasta Bommer, Imperial, Imperial Guard - Comments Off on Ork Superheavy Blasta Bomma Brought Out of Mothballs! Doesn’t look like much in the photo at left, a small cut. What you can’t see very well in the photo is the deep slice and blood bruising in the perfect shape of a #11 Exacto blade, outlined in light blue. Going to be interesting to see how long this takes to come all the way to the surface. 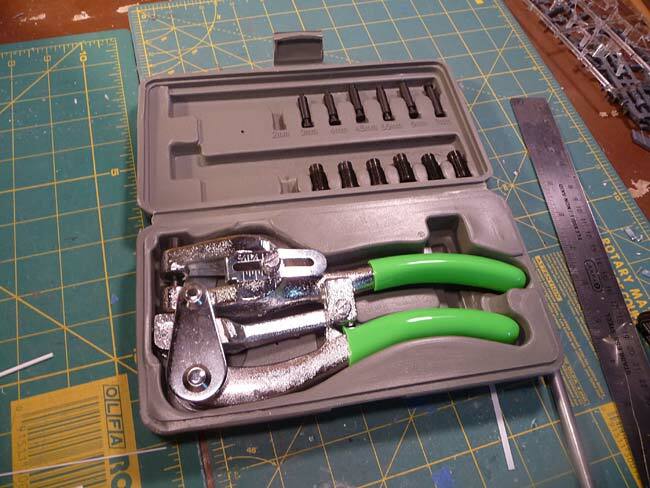 In other news, I purchased a new tool. A 1 ton aircraft steel punch! I got this for making rivets since my old punch all of a sudden went bendy-wendy on me, not sure why/how. This has various plug/punch dies that fit into it so I can make a few different sizes I’ll be using this soon on the bomma and I’ll let you know how it works. On the modeling front I did get some of that worked on today. First up, my test scheme for the new ‘umie force I’m starting as an alliance. 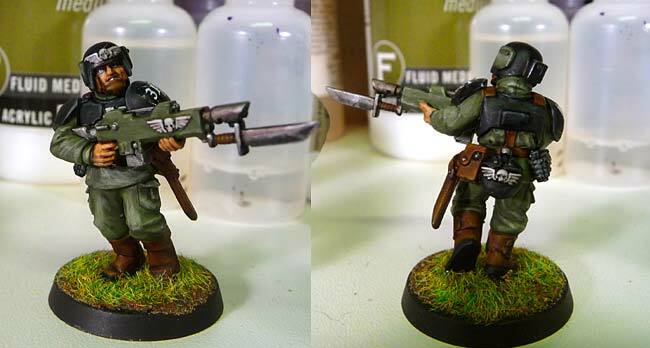 I like how he turned out except the green uniform is a little light in my opinion, I want something a little more towards an olive drab green. I know how to fix that, just didn’t go back to change this whole thing. I also tried the decals from the box and was sorely disappointed. I think I’ll just go with some freehand of some sort. I might also play with the gun color, changing it to black as I think there might be a bit too much green going on and a little more black should balance that out. I also dragged the blasta bomma out of mothballs finally and started work on that. 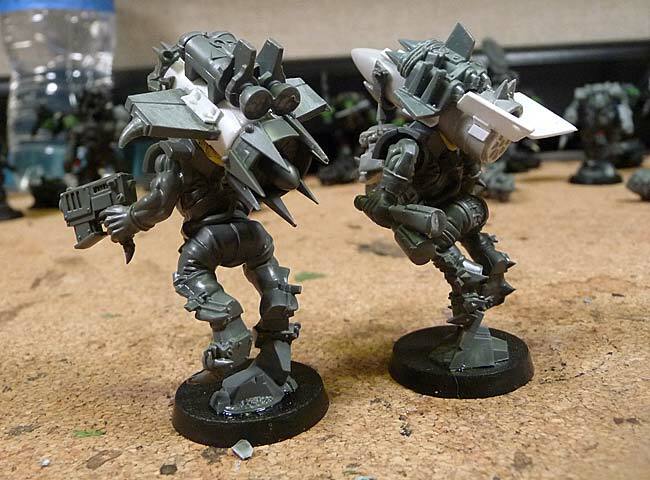 After putting the dakkajet together I figured out how I was going to do the turret gunners on top – grot gunners from the burna bomma parts! I just need another dakkajet and I’m good to go there. I started by wrapping up the detailing on the nose/deff arsenal section. Added the banding to “strengthen” the look and bolts/rivets to the bridge of the nose and new banding. Felt good to start cutting and gluing again. I’m hoping to keep working at a steady pace and completing this by the end of next summer. We’ll see! Did some work on the Bride and IG trooper tonight. You can’t see it from the photo but I airbrushed a coating of Bleached Bone over the entire gown, then do a white zenithal highlight from the top to let the Bleached Bone be my shadowing. It’s very subtle so nearly impossible to see in the pic. I’ve also done the bandaged arms. 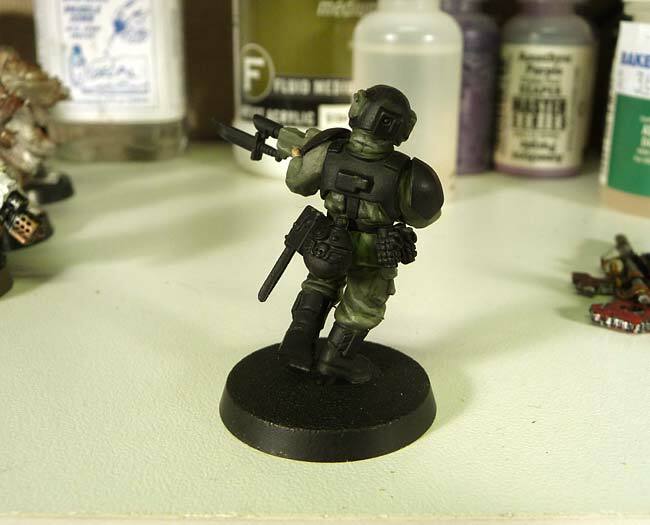 I’m looking for a color scheme for my new guard army too so trying something on a trooper. The idea is a medium green cloth with black carapace armor and brown boots. Nothing too fancy, they’re army, errr, guard! I think I’ve got too much highlight area as the medium green is disappearing. This is also the first time I’ve every done human faces so it’s gonna take a little time to master that. Now I’m off to research painting these guys eyes, they’re even smaller than orks! Sheeze, three days back on the bench and it shows me what for… Did something today I haven’t done in nearly 20 years – drove an exacto deep into my finger. One of those stupid things where two seconds before it happens you’re thinking… “YA know, if that slips it’s gonna go deep and hurt a lot…” SLIP! And in the 1/10th of a second it takes to go in and come back out, you’re already thinking, “Yep, that’s gonna bleed like a sonofabitch. Probably hurt too.” Well, it did both. Pre-drilling pilot holes in gun barrels with the exacto to make sure it’s nice and centered. 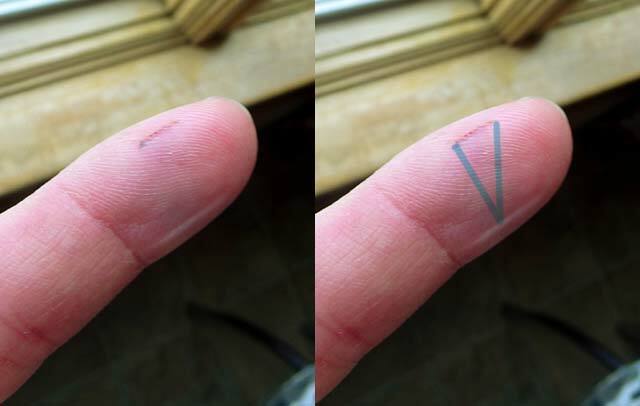 The hole was a little off so I tried to push the blade to the side to correct and WHOOP… off the precariously balanced barrel tip and deep into my finger. Oh well, direct pressure and three band-aides later I’m ok. Typing is a little awkward but I’ll handle. So if I’m making a post like this that means there’s updates and pics. I’ve got both for ya all. 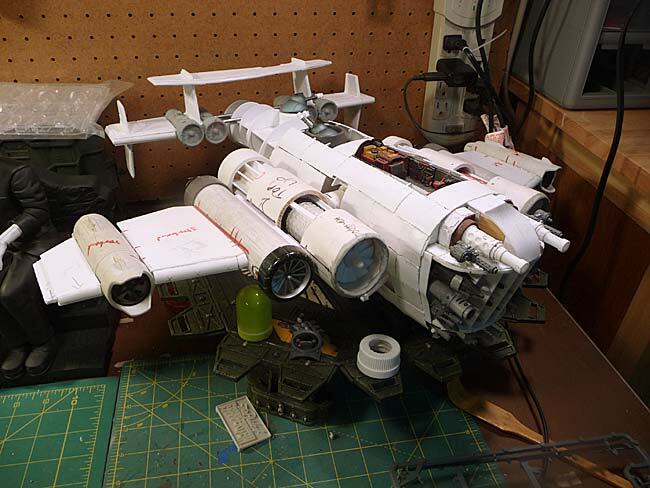 It’s amazing how much you can fit on a workbench when there isn’t a Thunderhawk on it! 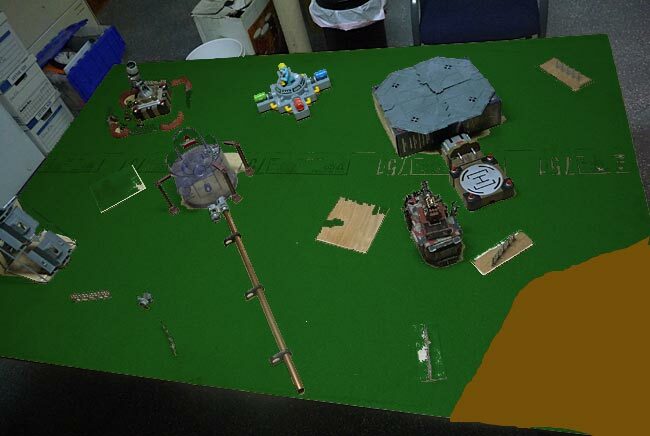 There are four main projects I’m working on, all of them are green of a sort but not all are orks. First up is a kit my wife wanted me to make and paint for her. 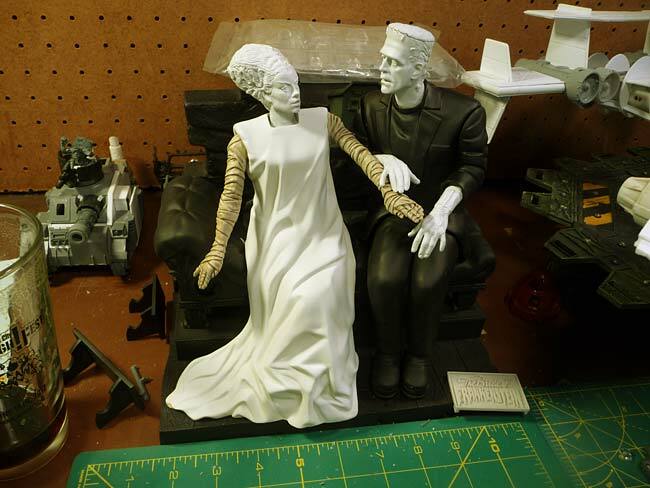 From Moebius it’s the Bride of Frankenstein 1/8 scale model kit. This is a great model, well done. 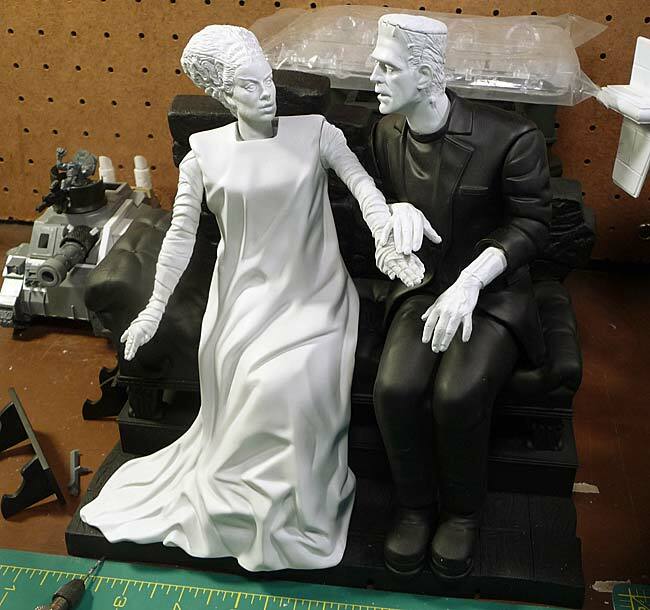 Also my first large format model with human(oid) figures. I’ve assembled, cleaned, puttied, sanded and primed the sub assemblies. Here’s where it’s at with all the parts in place. It’s about 10″ across and 9″ high. He’s green, right? Yeah, that’s my story and I’m stickin’ to it. I’ve brought the blasta bommer back out and staged it so I can think about things while I’m working on other things. 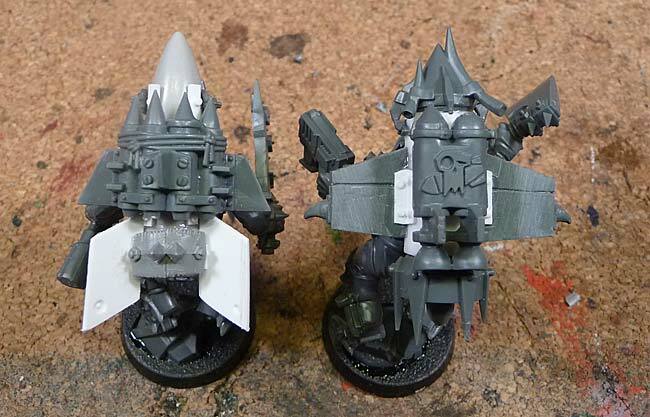 Working on my new dakka jet (below) I came up with some solutions that will allow me to move forward with this beasty. I’m starting to feel excited by this project again instead of the creative block I’ve had for some time. This will segue nicely into the next portion of the new Red Jack Air Farce. 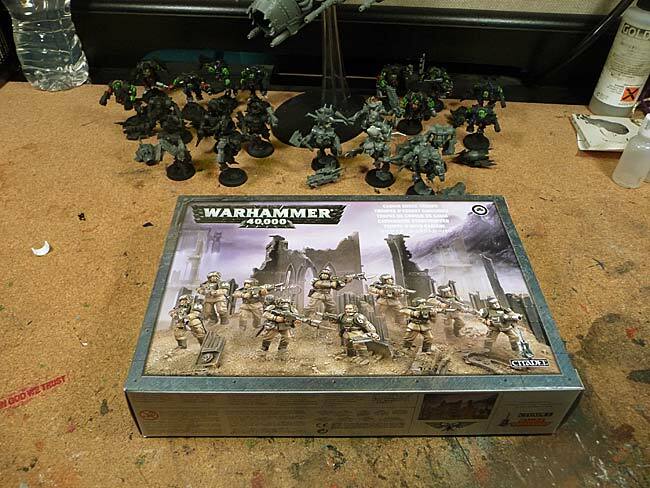 I needed to create two rokkit paks for my new stormboyz mob as I sacrificed a number of important parts bashing my Wazzdakka model last year against Uberdark. Here’s the new packs made from the bitz box scraps and some styrene tubing and channel. This leads to the expansion of the original new-model stormboyz squad I started about a year and a half ago. I’ve added 10 more to the squadron and assembled a dakkajet today to go with’em. When I started painting the large aquilla on the top deck I was originally going to mask it out and airbrush it in layers. After looking at it for a few minutes I decided to use a brush instead thinking how difficult masking this off would be and how long it would take. Stoopid me. I started with a brush and tried my hardest to make the layers even and without brush marks. The foundation color, Deneb Stone, went on ok. A little sloppy but figured the next two colors would compensate for this. I put down two layers of Deneb Stone, then two layers of Bleached Bone. Because of the lighter colors over black primer, it was nearly impossible to achieve a smooth finish before hitting the Skull White. I had almost four hours into just the aquilla. 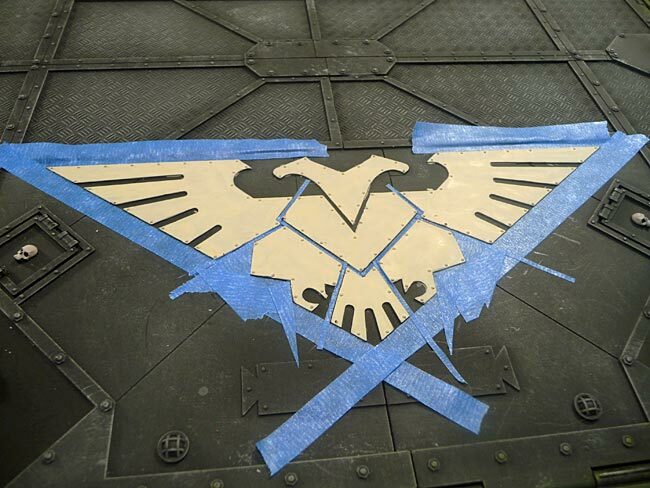 This started me thinking about how long would it really have taken to mask off the intricate aquilla. Well, I found out tonight. A little over an hour to do both. It took me another 10 minutes to put down two layers of Skull White and 15 minutes to thoroughly clean my airbrush, another 5 to remove the masking tape. I’m assuming with two more colors to apply and dry, those would have taken about another 30 minutes. This would have been a total of around two hours. I had already wasted 4 hours on brush work (grrr) so I’m assuming if I would have started masking instead of painting, I would have saved around 3+ hours on it. So, what do I do? Turn it into a tutorial! 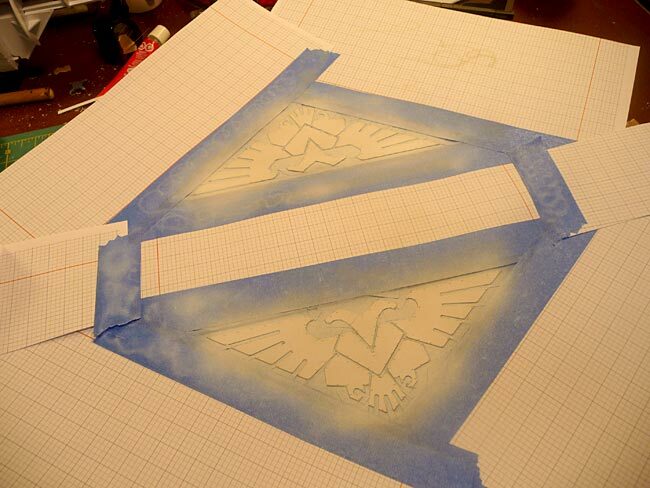 Detail masking for airbrushing. 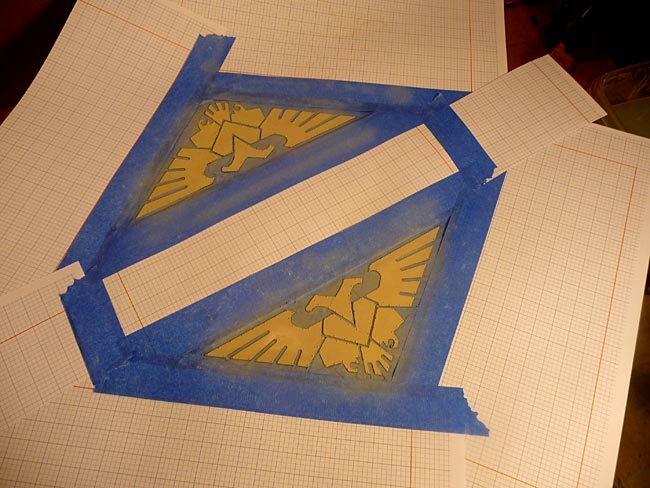 Here’s about halfway through the first aquilla, pretty intricate – and a little daunting. 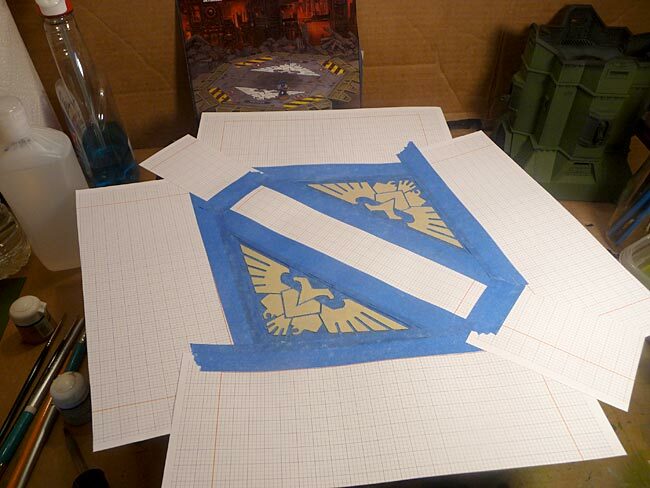 I’m using lo-tac blue painters tape. I stick it down lightly to my self-healing cutting mat. 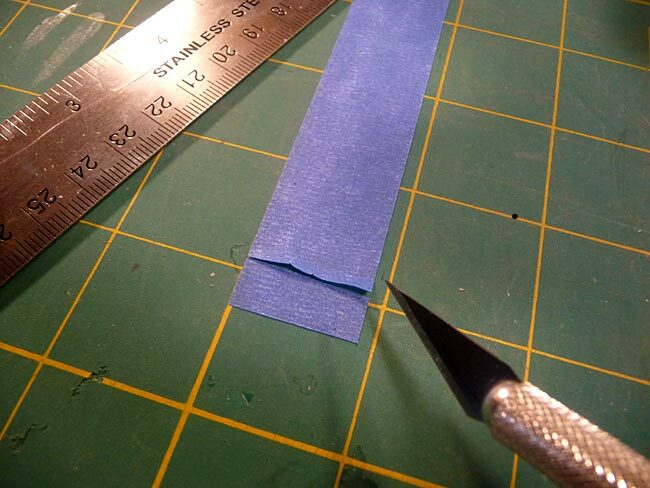 I use a steel rule to cut the skinny channel sized pieces of tape. 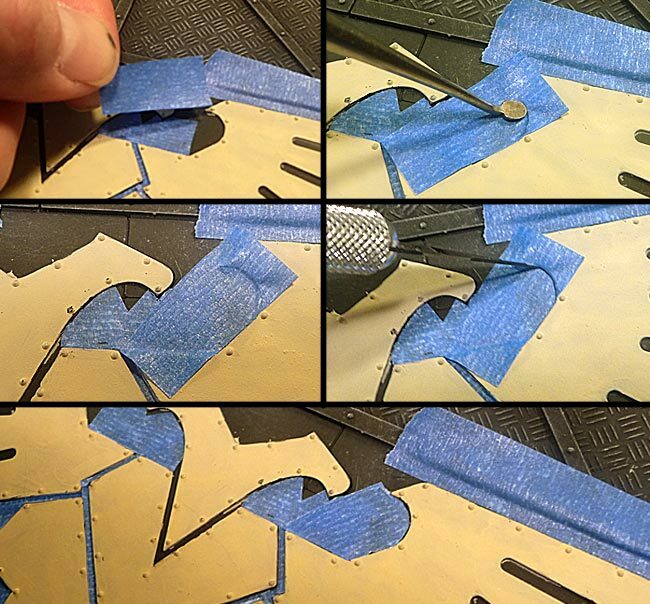 I cut angled pieces and apply them to the edges and push them into place using a rounded end dental sculpting tool. This is really easy, pushing the tape into place and making sure it fits snuggly against the edges of the raised aquilla. Here’s the detail masked aquillas. Then the rest of the landing pad is taped/papered off to prevent overspray. I re-coated the squilla in Bleached Bone to smooth out the surface before applying the white. Then applied two layers of Skull White. 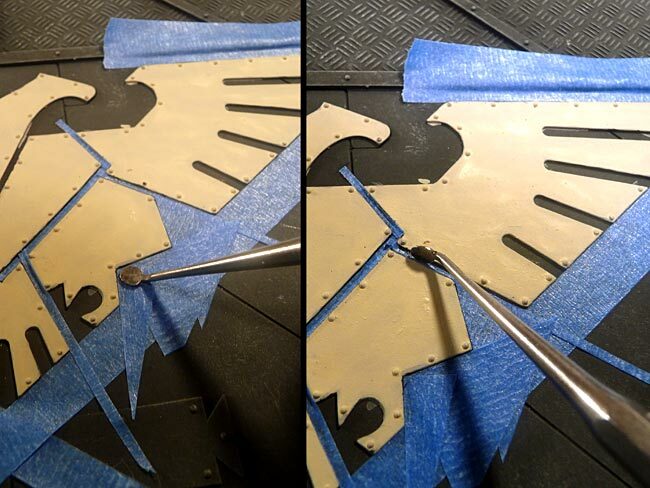 Here’s the skyshield with the masking tape removed and a closeup. 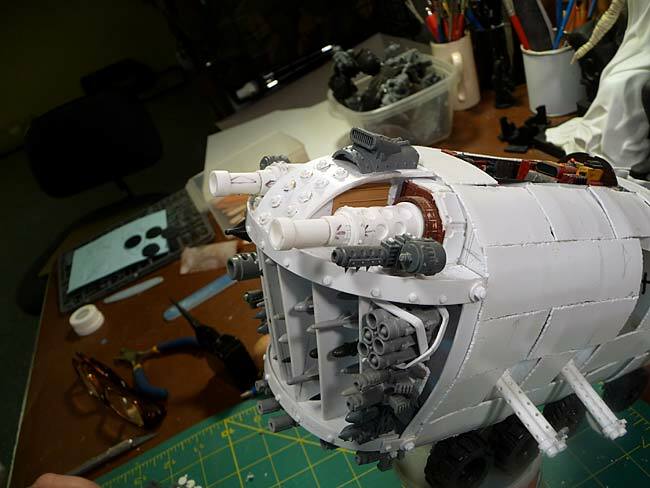 The next step will be the chevroned panels, then I’ll do the weathering. 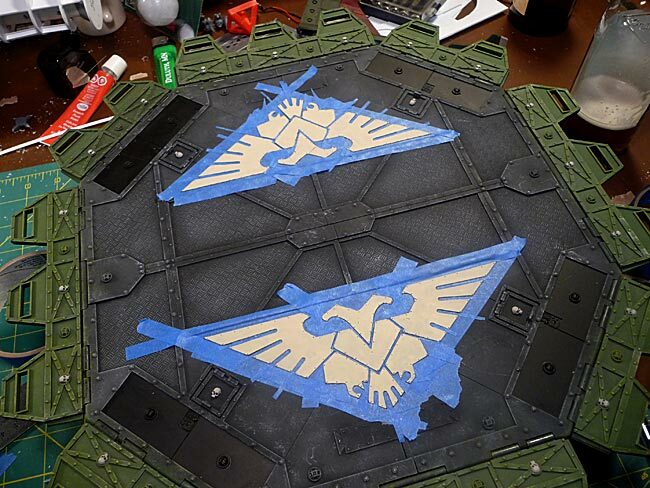 Skyshield Landing Pad – Airbrushed! 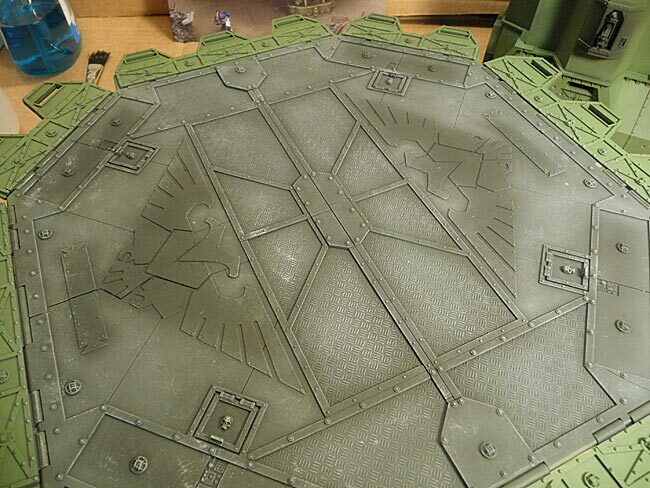 by sukigod on February, 27, 2012 in Imperial, Terrain - Comments Off on Skyshield Landing Pad – Airbrushed! 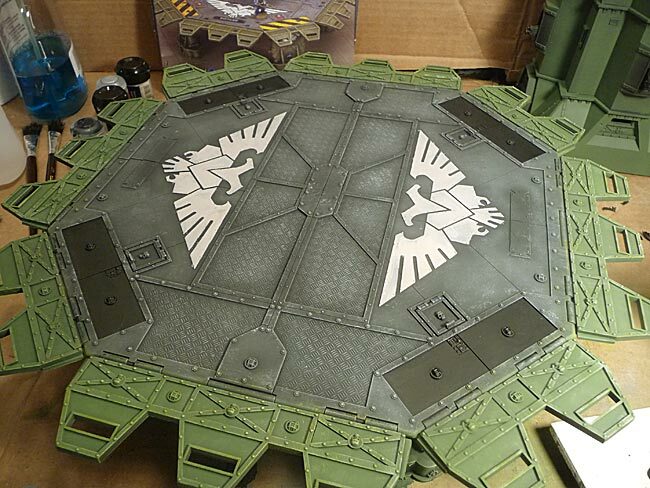 Spent some time with the Skyshield landing pad today – that and my airbrush! Finally! 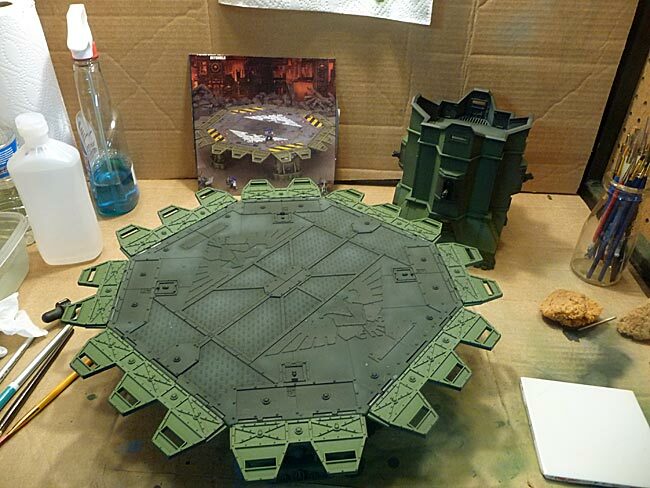 I primed both the Skyshield and the bastion black blocked out the main color areas with the air brush. 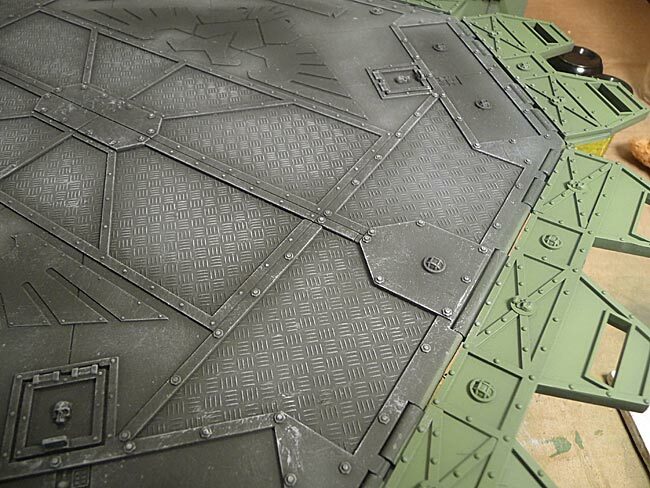 The top side of the landing pad was airbrushed with two colors – Tamiya Nato Black XF-69 and the lighter Neutral Gray XF-53. 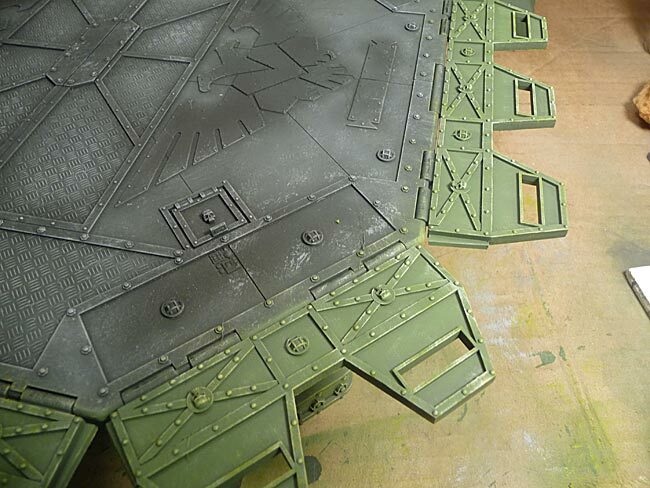 The side shields and the rest of the platform were airbrushed with Knarloc Green. Then it was gone over again with Fortress Grey. I will be doing metallic highlights to accentuate the wear and tear on the edges in some areas but only after I’ve done the rusting and grease stains. 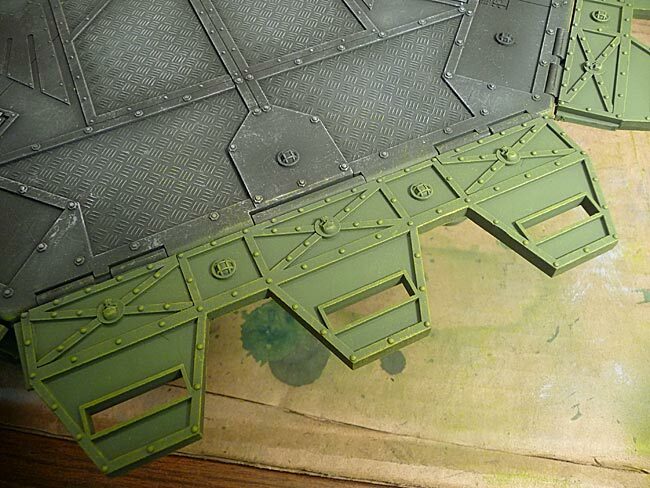 THe green areas were then dry brushed with Camo Green. This give the edges a nice “pop” but the overall effect is a little too neon-ish and bright so I went over everything again with a dry brush of Rotting Flesh. This toned down the brighter green of the Camo Green and gives the right worn look for the green edges. Here’s the overview with all the dry brushing done to bring out all the details. Of course, this isn’t where it ends, it’s merely the beginning. Now it’s on to all the small details – and this thing really does have a lot of details, Lights, aquillas, skulls… There’s a bunch of each. I started blocking out the hazard stripes sections and the aquillas on the main deck. I plan on doing the aquillas in three layers starting with Deneb Stone, then I’ll do a smoothing layer of either Bleached Bone or Kommando Khaki, then an overcoat of Skull White. It’ll take me a while to block out all the other colors so it’ll be a few days before another update on this. Feels kinda nice to do something different. 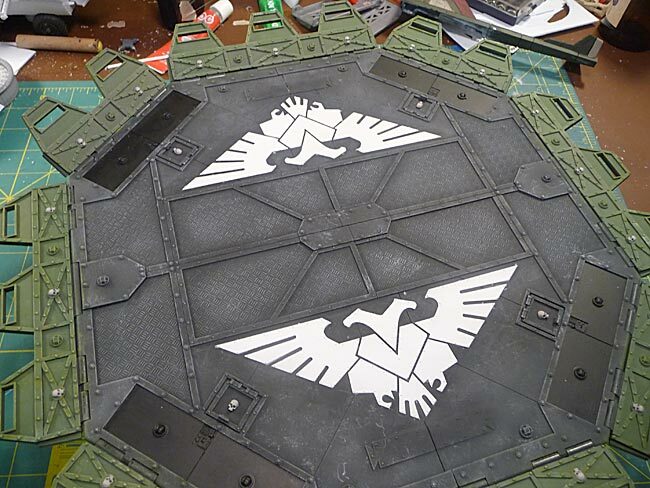 The bastion will get a similar treatment but with making it look like spray painted cement instead of metals. I think there’s about 6 or 7 people who are making boards already and of course I have to do one as well. 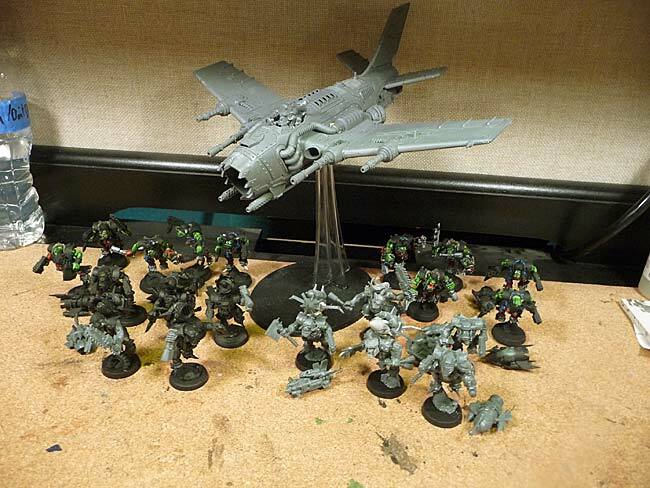 My first thought was “ork mekyard” which ir right up my alley. After seeing the current state of my real life though I decided I might not be able to finish it so I fell back to an Imperial Promethium (or something else liquidy and valuable…) pumping station that needs to be guarded and have air landing access to. This allowed me to use a couple of kits I’ve had sitting on my shelves for about a year. The original idea was to orkify these but I can always pick up a few more when I get to that. 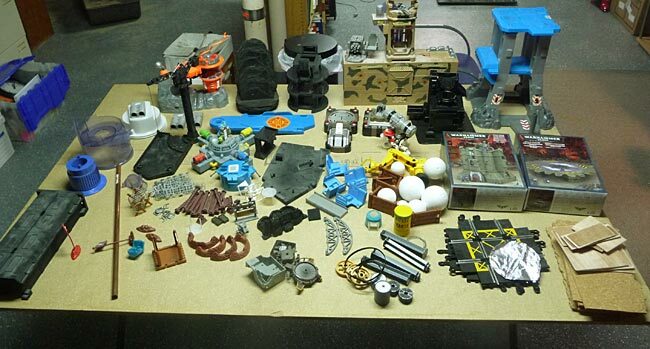 Here was my original layout of big stuff to sort through for consideration. 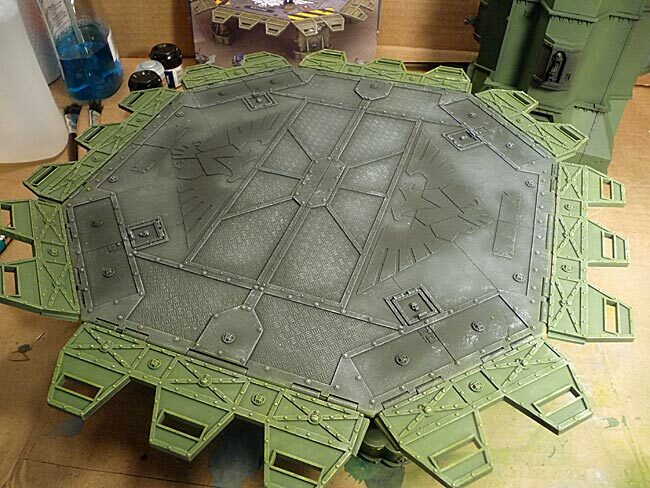 I’ve assembled the Bastion and the Skypad and they’re primed, ready for airbrushing today. 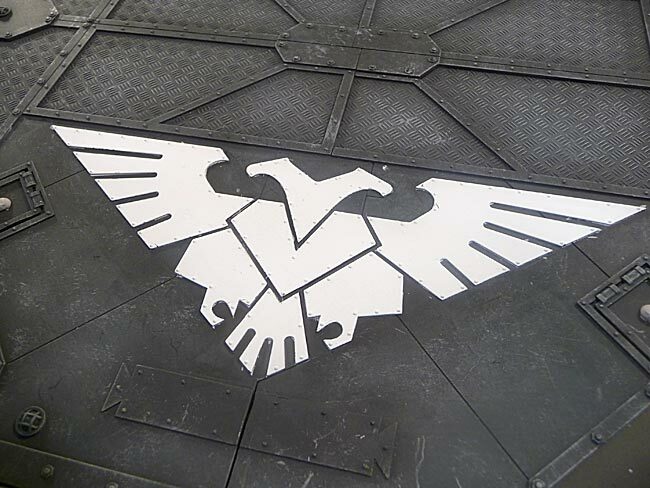 These will be done up pretty standard, just with a really nice paint job. Then I’ll work on the pumping station part. I’m still not sure if I’ll include the greyish colored pipes/pump thing (was a Monsters Inc toy/game thing) and there’s going to me some trees and hills as well.